Penny from Taylored Curiosities went all-out this NYCC, supplying us, Big Kev's Geek Stuff, Suburban Vinyl and MyPlasticHeart with her beautiful custom creations. 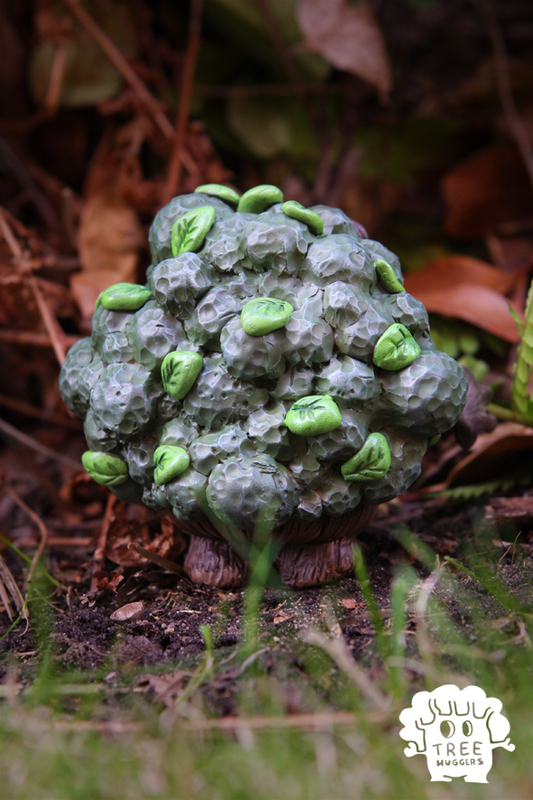 The pieces she made for us are called Tenacious Coralites. These are sets (as pictured above) in an edition of 3, packaged in a recycled box with printed illustrations. Everything Penny does is visually tight and well-thought-out. 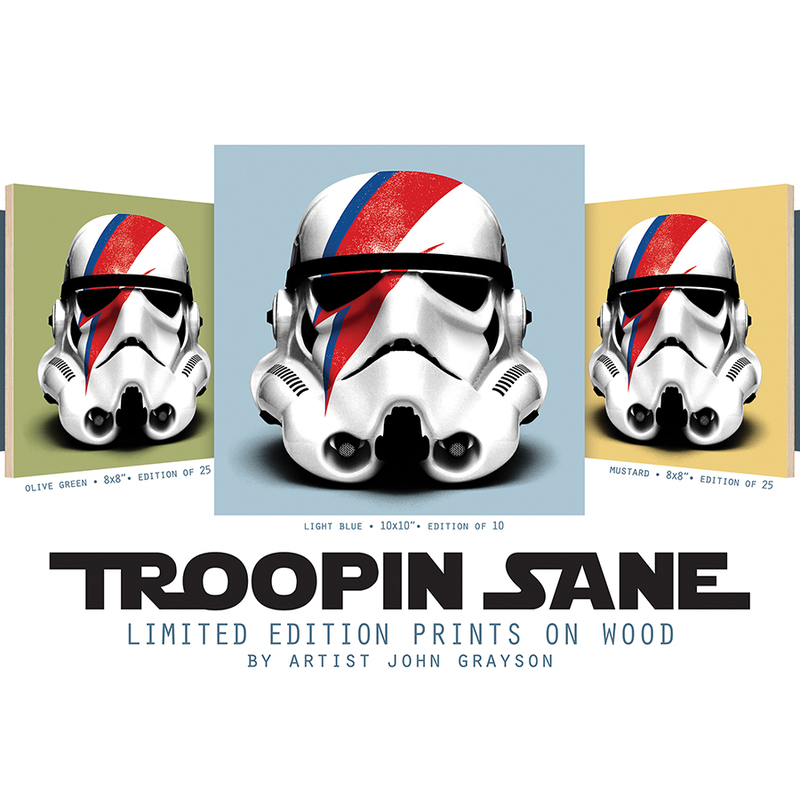 And with such a small edition size, and a price point of $75, these won't last long. Thankfully all four of the above mentioned booths are very close to one another, so if you are a big Taylored Curios fan, you can run around fairly quickly and grab all of her pieces. For more info on the Tenacious Collective Booth 208, click through to our website here, or just click here to see all of our blog posts about all of the exclusives, signings and releases. And don't forget to add us to your Show Planner! We are honored to finally be working with Sekure D. Stop by our booth early to grab these, they won't last long! 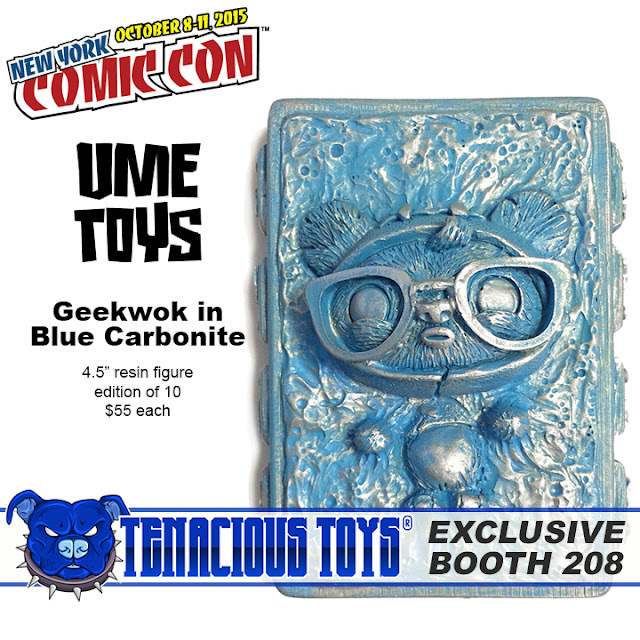 Our buddy Rich Page of UME Toys kindly humored my request of MOAR GEEKWOK IN CARBONITE... I love this figure. Rich cast 10 of them in a special Blue Carbonite for us as an NYCC Exclusive. They are resin blocks, approx 4.5" tall, priced at $55 each. Rich will also have pieces over at Big Kev's Geek Stuff, the best podcast known to man, and those guys will be chatting with us during the show about all the sweet geekery that will be available in high concentrations in Booth 208. 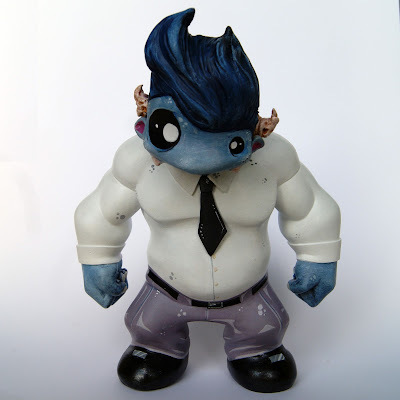 Matt Obscure Perez of Angry Koala Gear has blessed us with 15 of his 2.5" Oop figures in an exclusive blue color for NYCC! $35 each for a handful of adorable at the Tenacious Toys Booth 208. 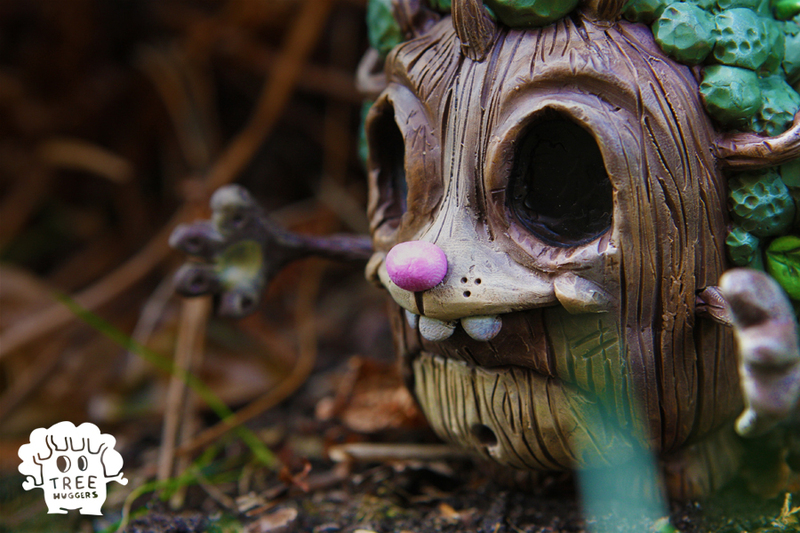 Oop is a forest dwelling orphan. The offspring of forbidden love... a fawn and a goblin. 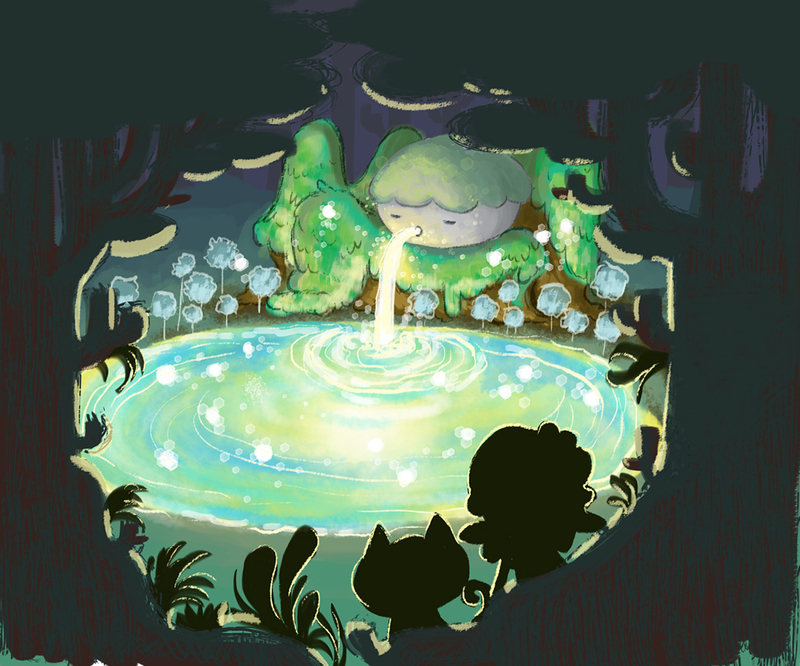 He is a lonely soul, wandering the forest for companionship. 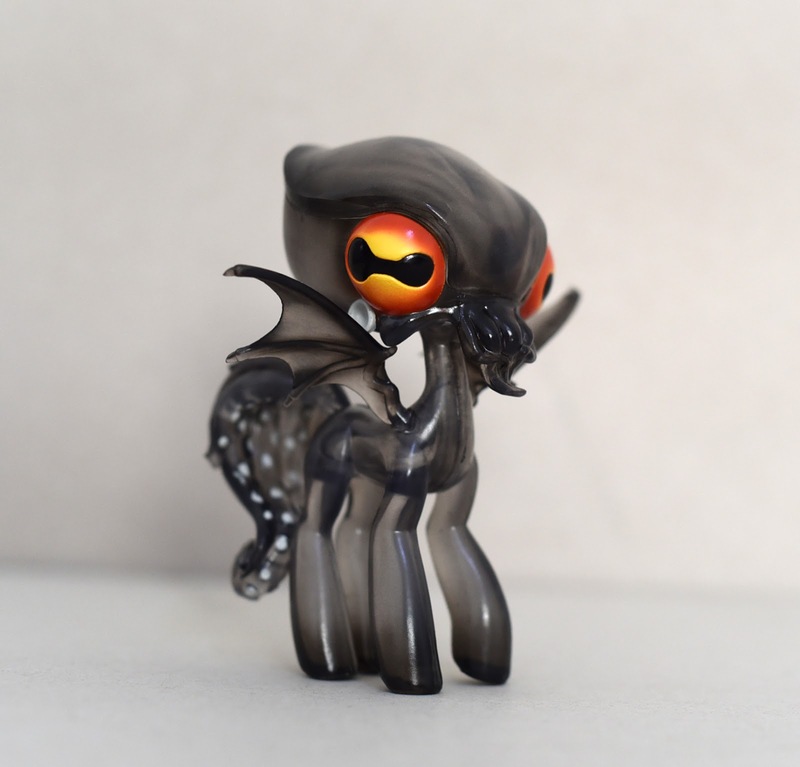 Convention Exclusive has announced their NYCC Exclusive 4-inch Lil Maddie Gray Mist figure. Part of Bigshot Toyworks' Four Horsies of the Pocalypse line of toys, Gray Mist joins Bigshot's own exclusive, Hellfire Red, as the two 4-inch Lil Maddies that will be debuting at NYCC as exclusives. 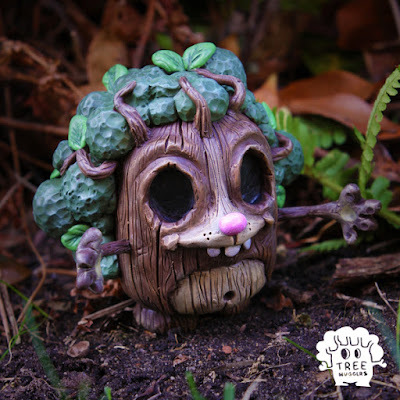 The Gray Mist Lil Maddie is limited to 500 pieces and will be available at the Convention Exclusive Booth #2654 for $30 each. Lil Maddies come packed in full color window boxes, and Convention Exclusive is offering a bonus Four Horsies tote bag for attendees purchasing their Lil Maddie Gray Mist edition figure at NYCC. Check the Convention Exclusive listing on the NYCC website for their other exclusives. OK so I've been saving this post. Not avoiding it, just preparing. It's.... big. 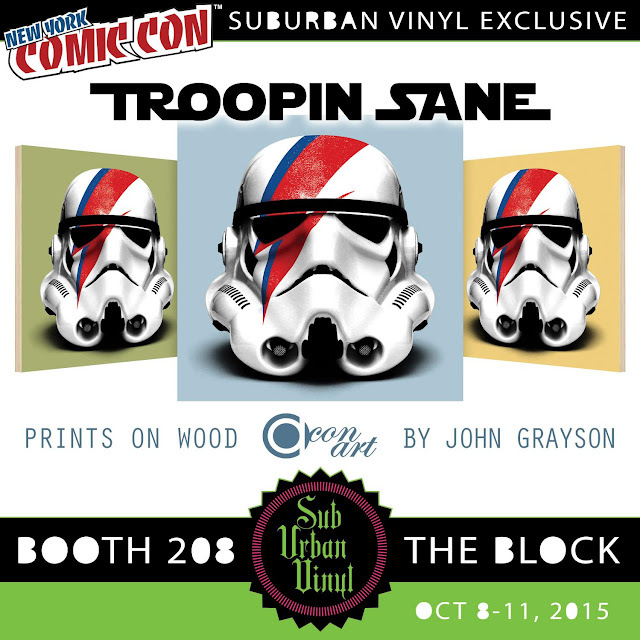 Suburban Vinyl has a big presence at NYCC and trying to encapsulate everything they are doing, showing and selling is not an easy task. 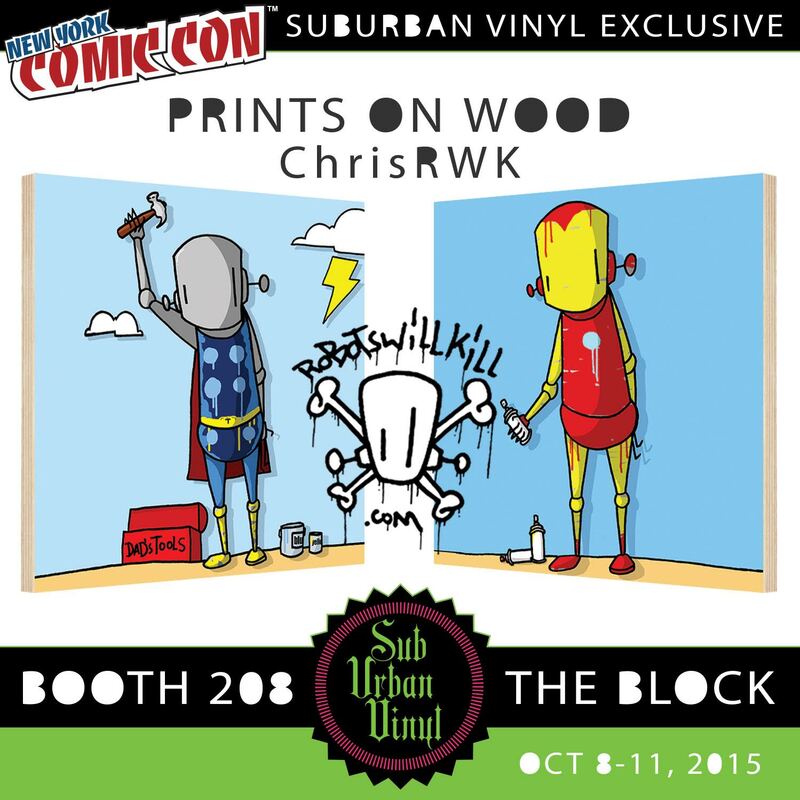 Below you will find the Suburban Vinyl NYCC Exclusives, the other items they will be selling, their custom show, their guests, their signings, and the live painting that will be happening in their booth. Again, in case it's not clear: Suburban Vinyl is a part of the Tenacious Collective in Booth 208 in The Block at NYCC 2015. One giant booth, lots of stuff happening. Below is the stuff that Suburban Vinyl has organized themselves. - Isobelle Pascha’s first retail assortment- she’s hitting the cosplay circuit! Buy 3A WORLD OF ISOBELLE PASCHA KUNTSLER COSPLAY now! New vinyl in the works from Toby Dutkiewicz. The 'Ta fang hsi-yu chi' by Hsuan-tsang (a Chinese scholar who wrote about India) tells the story of Apalala. Kasyapa Buddha was a man with the power to control the weather. He did so by controlling the evil dragons that possessed the power to bring storms. In return for his good will in controlling these storms, the local people offered him grain. Eventually, the people started to forget to offer the grain and Kasyapa grew angry. He prayed that he would become a dragon, so that he could punish them for their selfish behavior. This prayer was eventually granted and after his death he became the dragon Apalala. He made his home in a pond in Udhyana (an old name for the area of the Swat valley). He destroyed the area with powerful storms and rain. This continued every crop season until Sakyamuni Buddha visited the area. He persuaded Apalala that what he was doing was wrong. They came to an agreement where Apalala would stop his destruction in return for one crop every twelve years. Rather than relying on the people to provide the offering, he would take it himself by flooding the land. Check the video preview below for the upcoming Kidrobot 3" Dunny Series by Brandt Peters and Kathie Olivas - this one is called "The 13" and honestly it's looking pretty sweet. We will be picking these up and offering them via our Amazon shop, so you can get free shipping via your Amazon Prime account. Also available right now (on TenaciousToys.com): Wuz One No Strings on Me 8" Dunny, and preorders for both the 8" JRYU It's a FAD Dunny and the 8" Scott Tolleson Imperial Lotus Dragon Dunny. Once again SubUrban Vinyl will be heading out to New York Comic Con October 8-11. 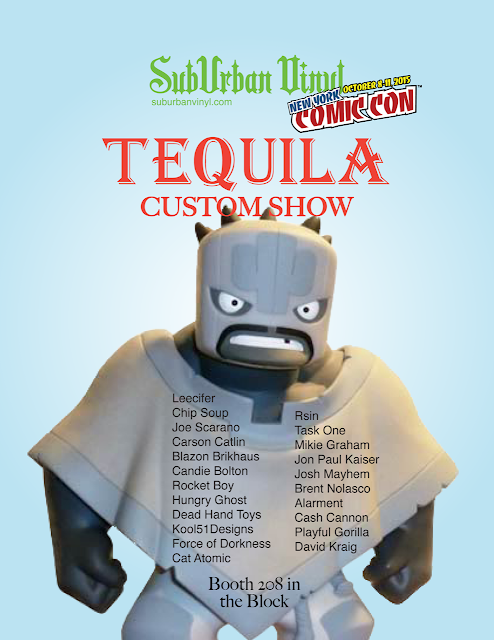 This time they will be showcasing their MuttPop Tequila custom show. They have gathered a great group of artists to contribute some amazing work for this show. 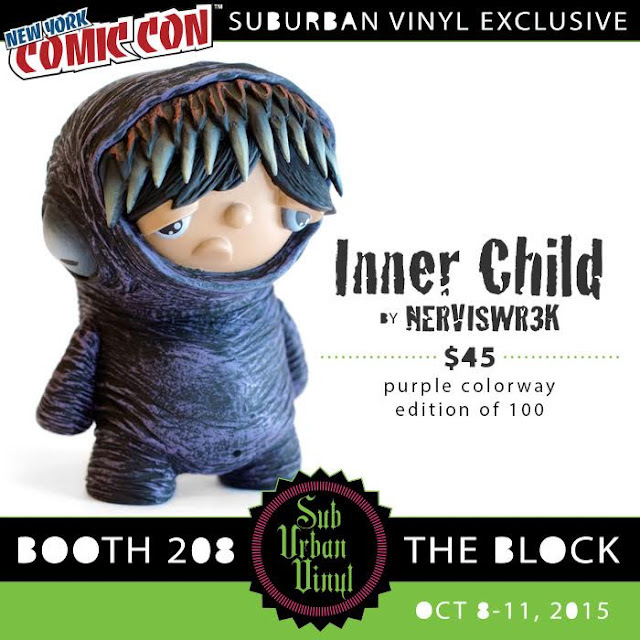 The show will take place in their booth in the Block within the Tenacious Collective booth 208. Pieces will be available for purchasing beginning on Thursday October 8th as soon as the doors open. Be sure to check out their Social media feeds as well as sign up for their newsletter to check out the latest information on what they will have to offer during NYCC. 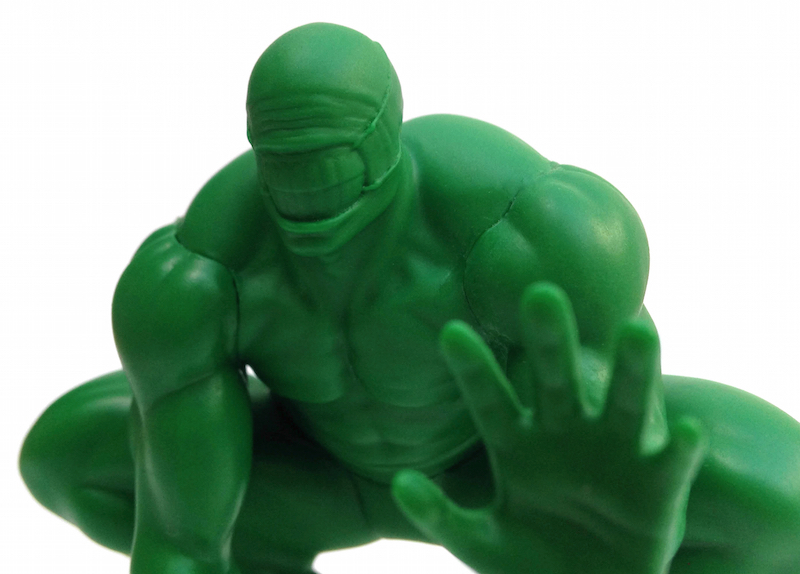 Joining us in Booth 208 again this year are our friends from Bigshot Toyworks, of course! Bigshot has hooked up a sweet exclusive 4-inch Lil Maddie in a never-before-seen translucent red color variant they are calling "Hellfire." 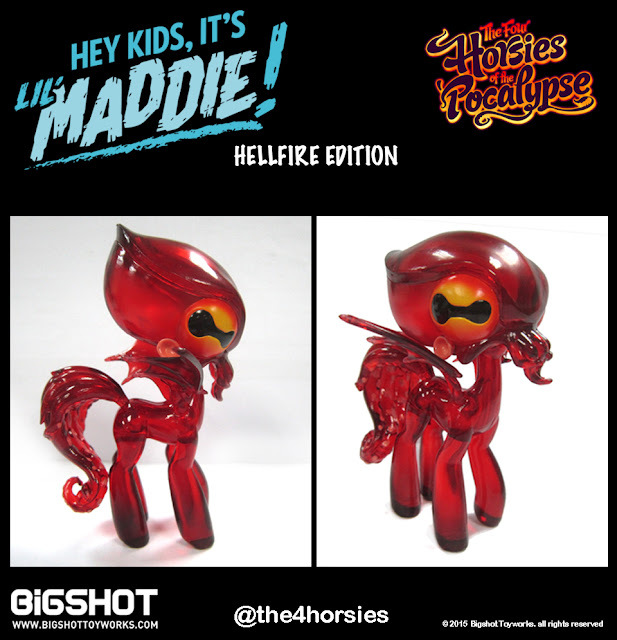 The exclusive Little Maddie Hellfire Edition is limited to 500 pieces at $30 each. She has articulation at the wings and neck and comes packed in a full color window box. Follow Bigshot Toyworks on Instagram here, and don't forget to check out their website to see more examples of their finely crafted design work. You can also peruse the Bigshot Toyshop to see all the currently available Bigshot merchandise: several color variations of the FUnicorn (Zero Fucks Hero), two color variants of Mike Mignola's Monkey with a Gun, several different All City Style trains, and the original, larger 6" Maddie figures. 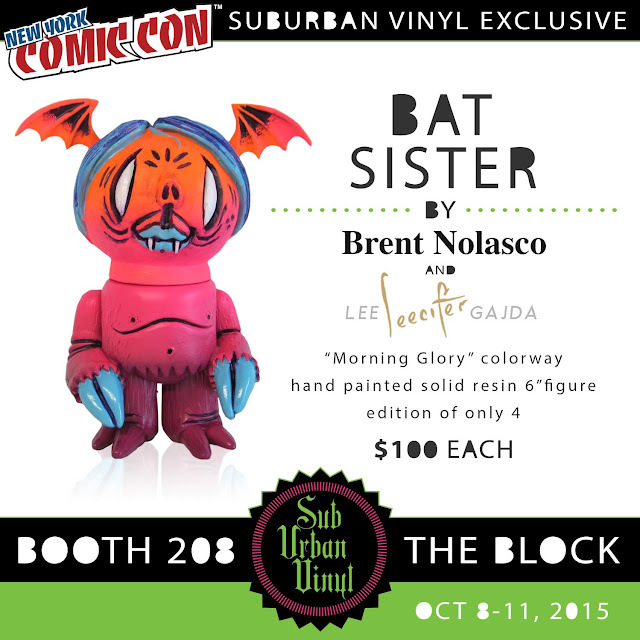 All of those items will be available in limited quantities for purchase at the Bigshot NYCC booth #208. Joining Bigshot Toyworks in their space in booth 208 will be two very special guests: Jon Schnepp and Holly Payne. Jon and Holly will be chatting, signing and selling Blueray/DVD copies of their documentary film The Death of "Superman Lives": What Happened? Jon Schnepp is the director of hit cult programs like "Metalocalypse" "Upright Citizens Brigade" "The ABCs of Death" and "The Venture Bros." as well as the writer/producer/director of the documentary feature film "The Death of 'Superman Lives'; what Happened?". Host of the popular web series "Collider Movie Talk" and "Collider Heroes". Holly Payne is an Artist, Filmmaker, Actor & Improvisor, as well as the "lips" of MTV's Liquid Television, and Producer of 'The Death of "Superman Lives"; What Happened?'. 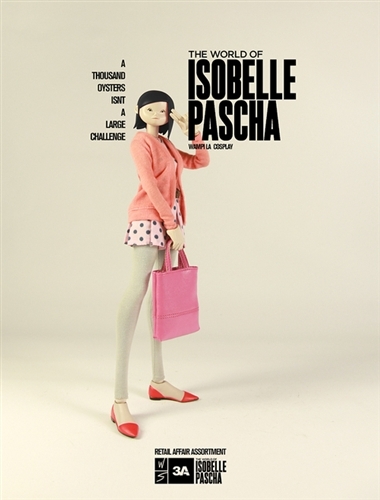 Buy 3A WORLD OF ISOBELLE PASCHA WAMPI LA COSPLAY now! 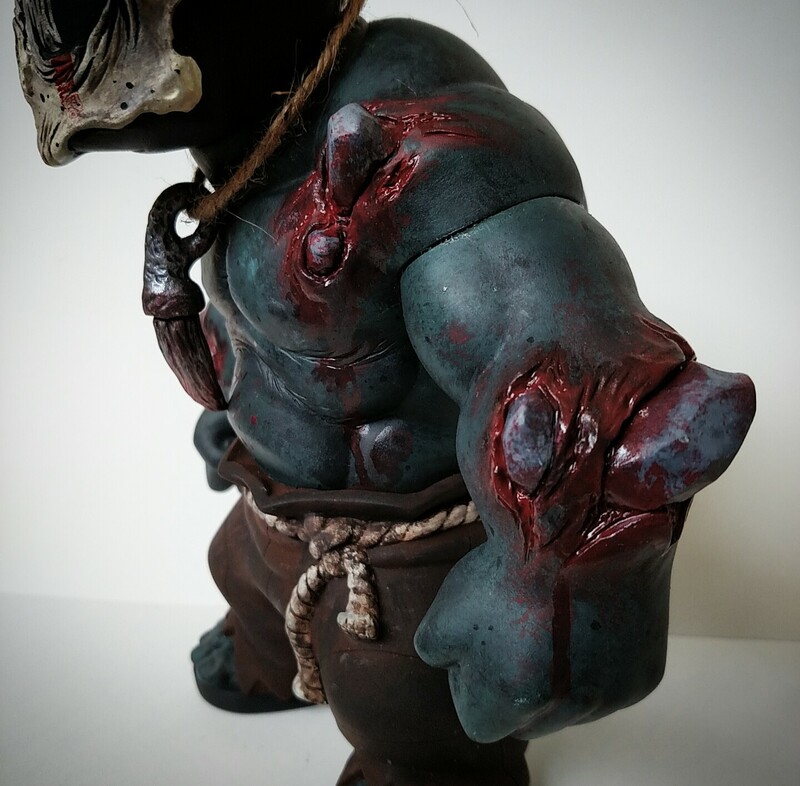 For sometime now, people have been seeing some WIP pieces featuring Geekwoks, a cute resin creation from Ume Toys. 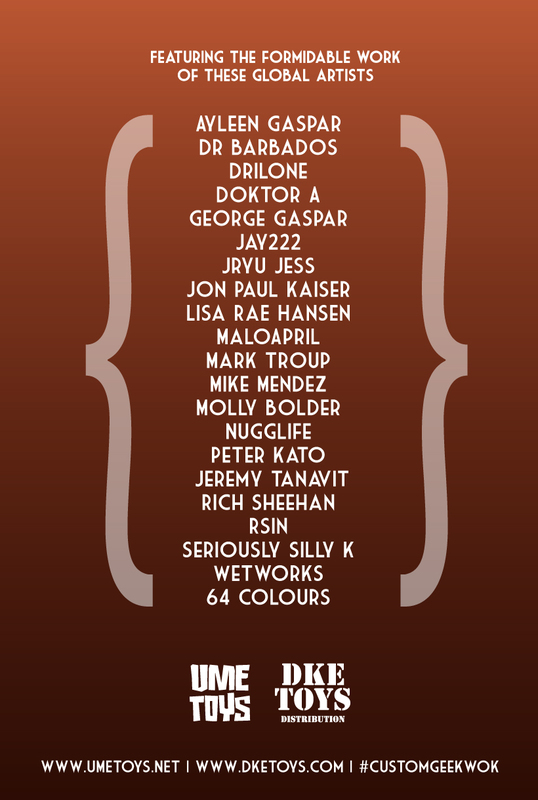 Well, there is going to be a show hosted by DKE Toys, held at Designer Con 2015(November 21-22). Featuring 21 different artist takes on the Ume Toys Geek Wok, the list of artist will definitely have a wide range of final pieces. 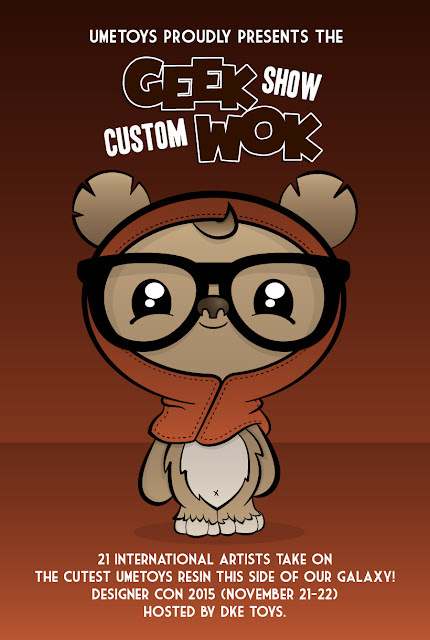 Already using the Hashtag #customgeekwok, artists have been hard at work putting his/her spin on the cute creature. As the show gets closer more completed images will start to popup. In the meantime, be sure to follow the Hashtag #customgeekwok, as well as all of the artists listed in the image below. From the beginning of our practice, we wanted to affect as many people as possible with the idea of an idealistic future - a vision of a future that's good for the future of our world. We show a world where the planet itself is a character and exemplifies a compassionate world, and make that into something that reaches as many people as possible, especially kids, so we are thrilled to be able to do this through a platform that briges television & the internet. 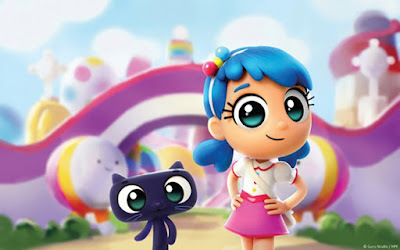 This show is based on our past works Rainbow City and Wish Come True, and incorporates many of our Wish Come True characters. Thank you for all the support and love. With online streaming becoming more and more of a viable option for ventures to take a chance, there is a good chance for True and Rainbow King to become a success and open the door for other artists' worlds to get transformed into a show. Be sure to check out more info in the FriendsWithYou website. 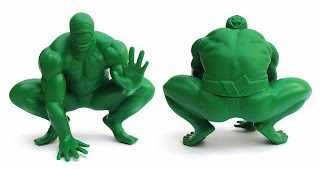 Tru:Tek will be releasing their very own figure in the Strange Monsters mini-figure line created by Unbox Industries, the Sunobite. 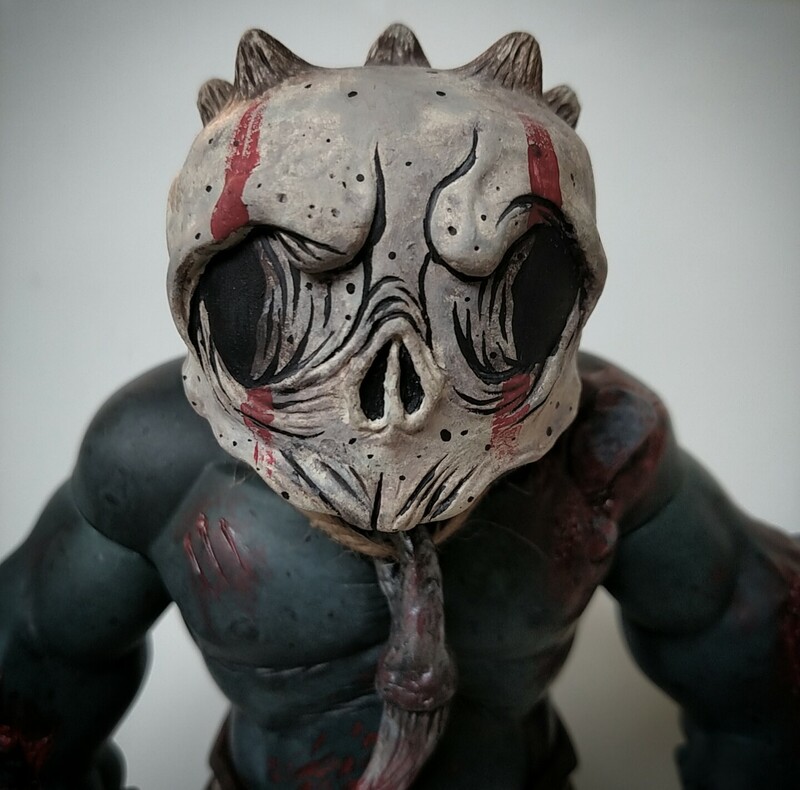 Representing the fourth release in the line created by Unbox Industries, Sunobite is a nightmarish mash-up of rikishi(sumo) and the Chatterer, Hellraiser's most fearsome cenobite. Measuring at 2.5" all the way around, Unbox produced the Sunobite in a unique deep green, rubber-like soft vinyl, for the first release. Priced at $15 each plus shipping, each Sunobite comes bagged with a header card and sticker. 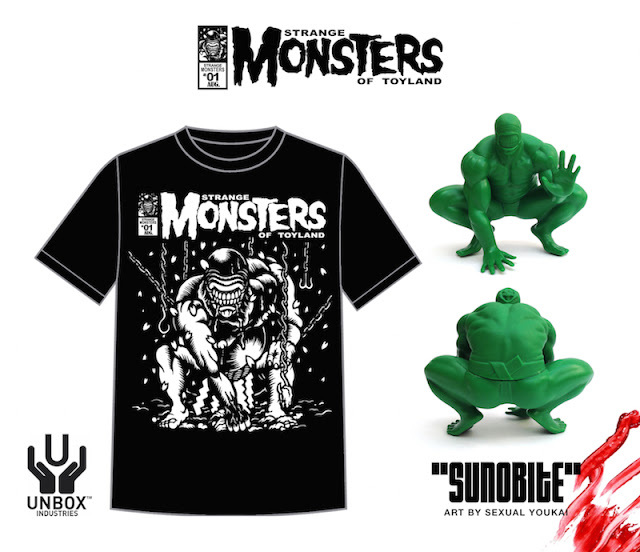 In addition to the cool mini-figure, Tru:Tek will be offering a companion T-shirt for pre-order, designed by Sexual Youkai. Priced at $22 by itself, a package deal will also be available which will include the shirt, matching mini print and the Sunobite figure for $35. The mini-print is limited to just 20 prints, so that will likely be the limit on the available set packages. The T-Shirt and figure will be hitting the Man-E-Toys online store on Thursday September 24th, at 7pm EST. 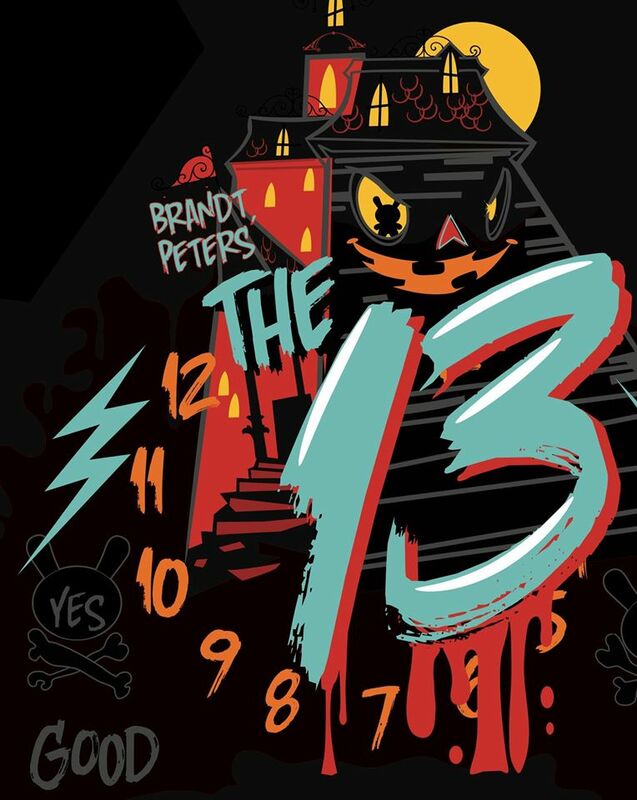 Keep in mind, that the T-Shirt is available for pre-order only until October 8th. 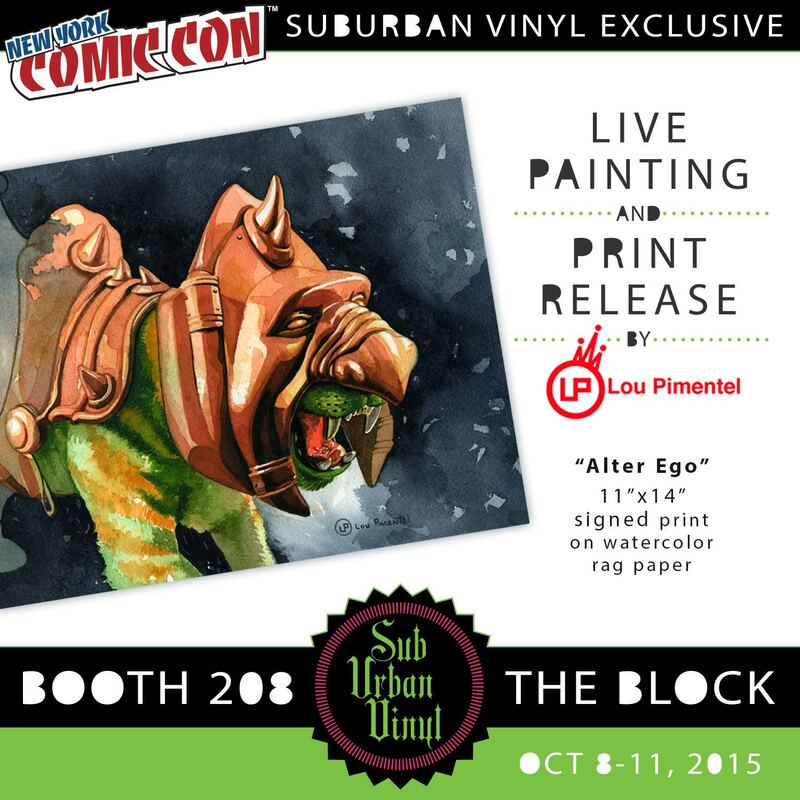 Be sure to keep an eye out for info on the first painted fun of Sunobites in the future. 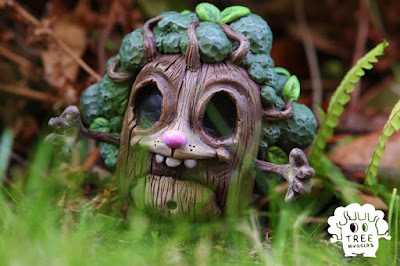 Ume Toys, Rich Page, has been working with Tommy Human to create an adorable prototype called Tree Huggers. Still no word on size, availability or anything other than the fantastic looking prototype created by Ume Toys. Be sure to follow Tommy Human on social media for more info regarding Tree Huggers. 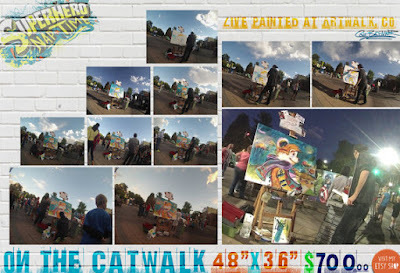 Unfortunately this post is a bit late to get people informed about the Longmont Artwalk in Longmont, CO. Cole Brenner, artist behind Superhero Nap Time, had a live painting session during the artwalk, where Cole painted a 48" x 36" canvas in roughly 4 hours. With the help of Cole's 2 year old , the end result is a Calvin and Hobbes inspired piece, with a "Schlopp of Dr. Suess' Oh The Places You'll Go, ' titled "On The Catwalk". 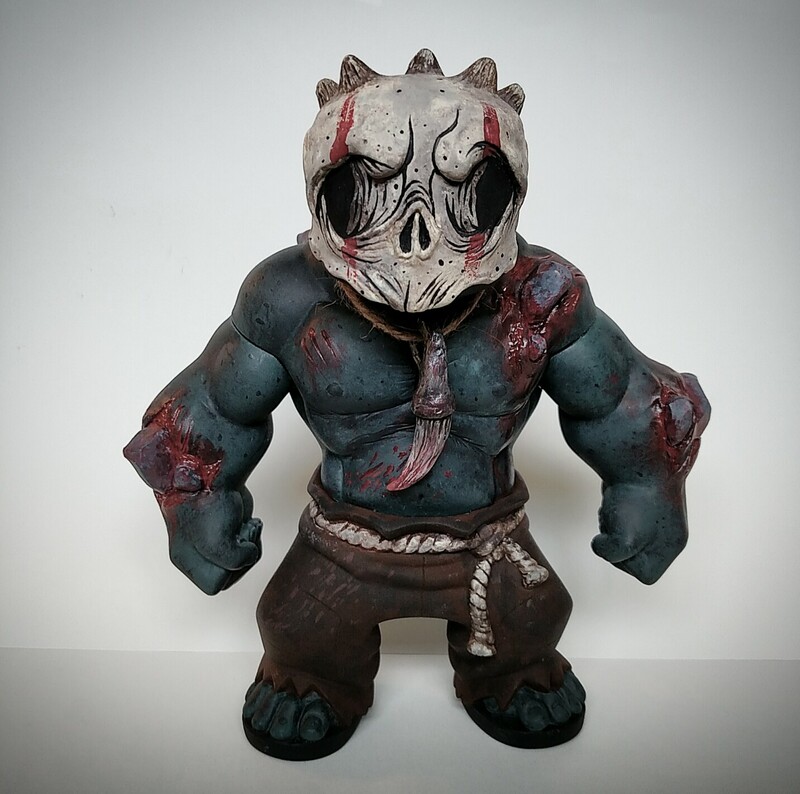 Cole Brenner is the same artist who created the My Bomb to Bear 3.5" Resin figure, available through Tenacious Toys. This exact piece, as well as many other art prints, are available through Cole's online Etsy shop, Superhero Nap Time. Priced at $700 plus shipping, this colorful piece is a great deal, especially considering the overall size of the painting. Be sure to check out Superhero Nap Time and follow Cole through FB and Instagram. 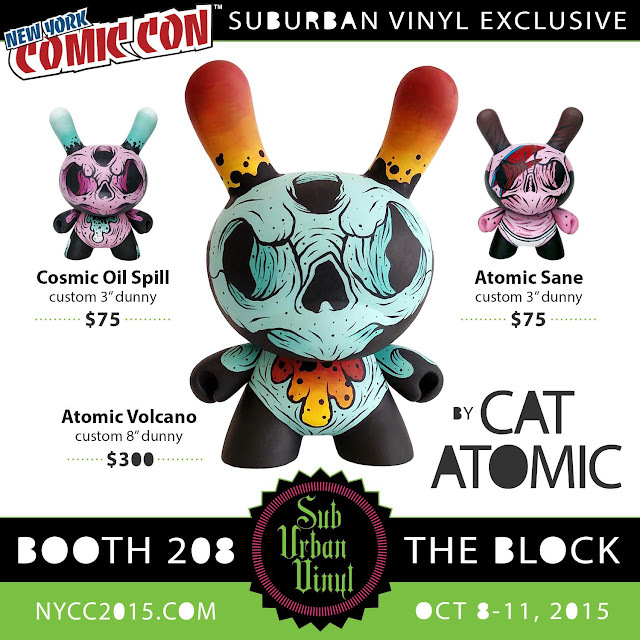 Vinyl Toy Artist Cat Atomic created a custom Muttpop Tequila for Suburban Vinyl's custom Tequila show, being held during NYCC 2015. Cat Atomic spent quite a bit of time sculpting some additional features on the Tequila figure, many of the WIP shots can be seen on Cat Atomic's Instagram Page. The skull face is a bit of a signature feature used by Cat Atomic on most of his customs. Usually sticking to a 3D looking painted feature, Cat Atomic took it one step further and decided to sculpt out some of the facial features he usually paints, such as the nasal area and eyebrows. Doing this actually allowed Cat Atomic to create even more depth and shading, but it doesn't look like he knew exactly how to approach the sculpted features which are normally painted, opting to essentially overlay the paint right onto the clean sculpt. Hopefully, Cat Atomic continues with sculpting the facial features of his pieces and begins to see where he can add more depth and pop, now that some features already exist. It may even be great to see if Cat Atomic cut more features into the facial sculpt, instead of having to paint the lines around the eyes. Also, adding a bit more contrast in color should go a long way in making certain parts of the figure pop and standout. 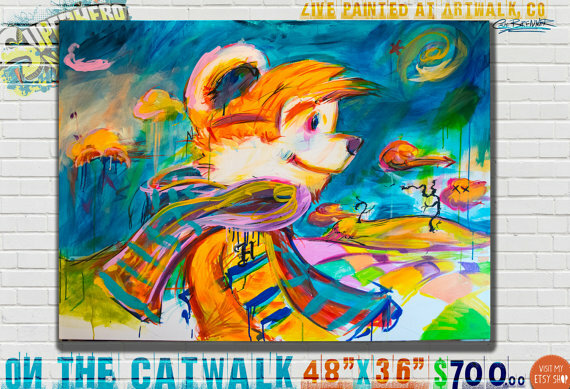 Overall, the piece is a wonderful representation of Cat Atomic's work. 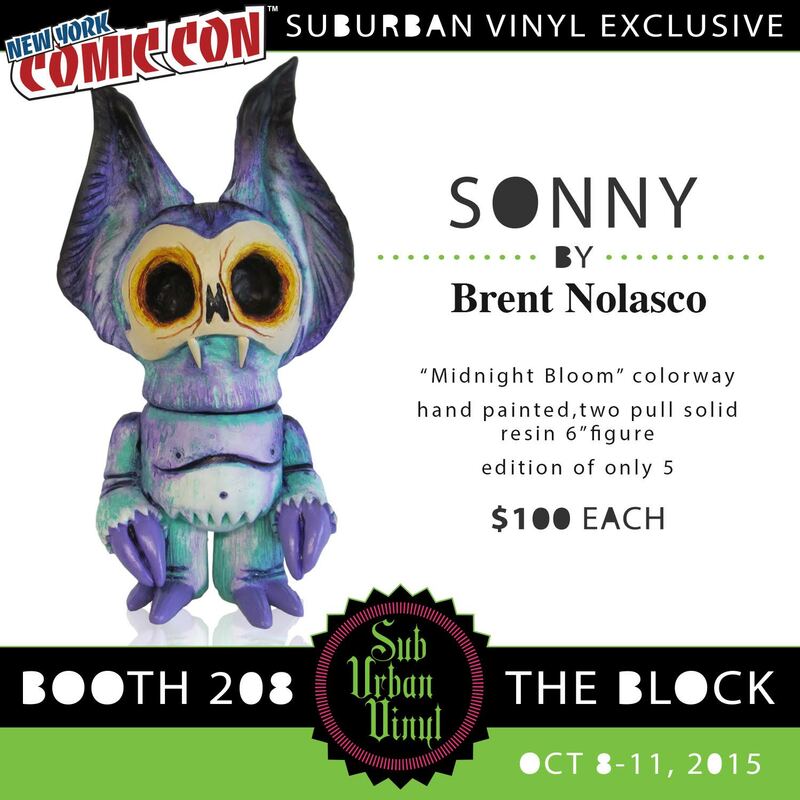 Priced at $220, this custom Tequila will be available at the Suburban Vinyl booth #208 during NYCC 2015, Oct 8-11th. During NYCC 2015, Suburban Vinyl is holding a custom Tequila show, featuring a good number of artists customizing the Muttpop Tequila figure. 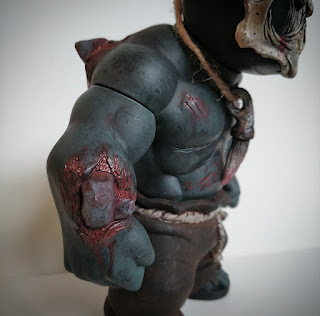 Rocketboy created what he is calling Gutwitz, a beefed up version of his Nohwitz character. Standing over 8" tall, Gutwitz is priced at $250 and will be on display and for sale at the Suburban Vinyl booth #208 in the Block. Any left over customs will be available for sale after NYCC, through Suburban Vinyl. 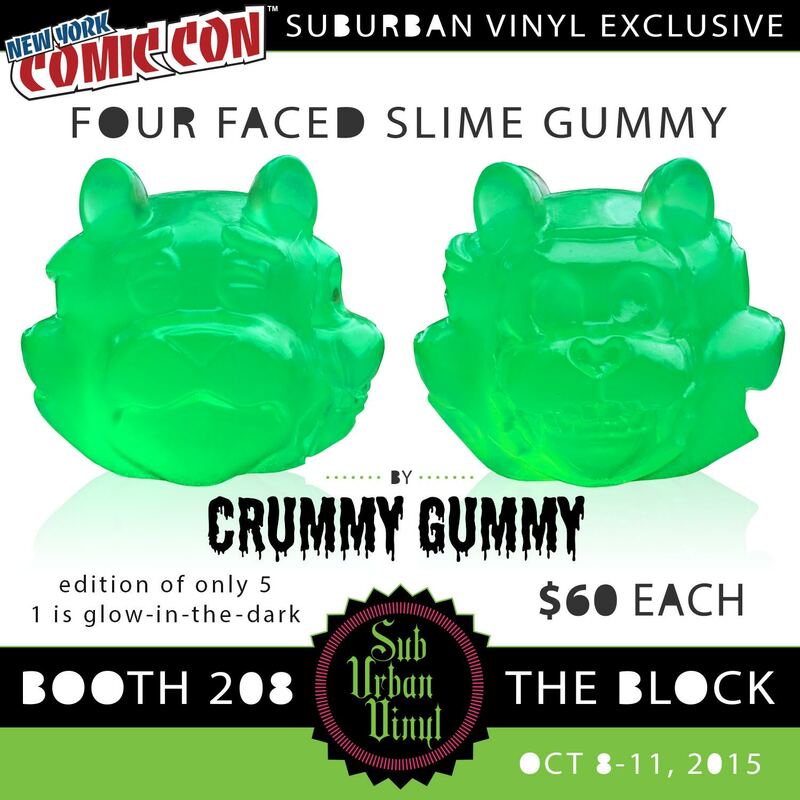 With NYCC 2015 right around the corner, many pieces are beginning to pop up. 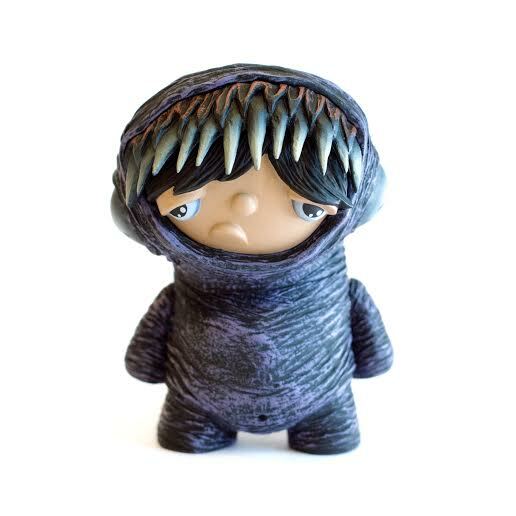 Art toy sculptor Seulgie Lee will be releasing an exclusive colorway of her popular Satyrs at NYCC for the first time. Seulgie is a Brooklyn based artist who first imagined the Satyrs, when she first drew them, in sugary pastel colors with delicate sparkles and glitters around them. To that effect, this release of the NYCC Satyrs are what Seulgie first envisioned. Each of these NYCC Exclusive Satyrs stands at 4.5" tall and is resin cast in pink and blue. The attached ribbon and Swarovski are specific for NYCC. 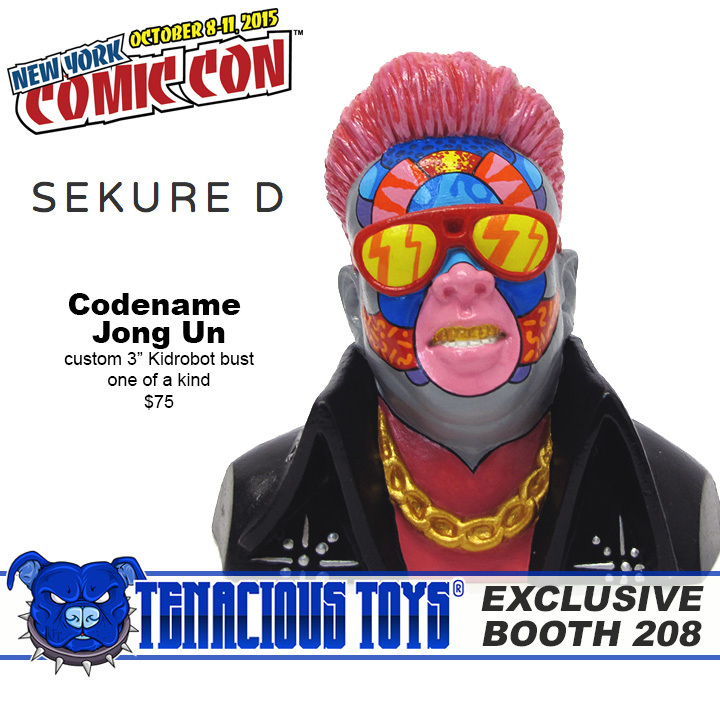 Each one of these Satyrs has been created by Seulgie herself and she has teamed up with MyPlasticHeart to have these for sale at NYCC 2015. 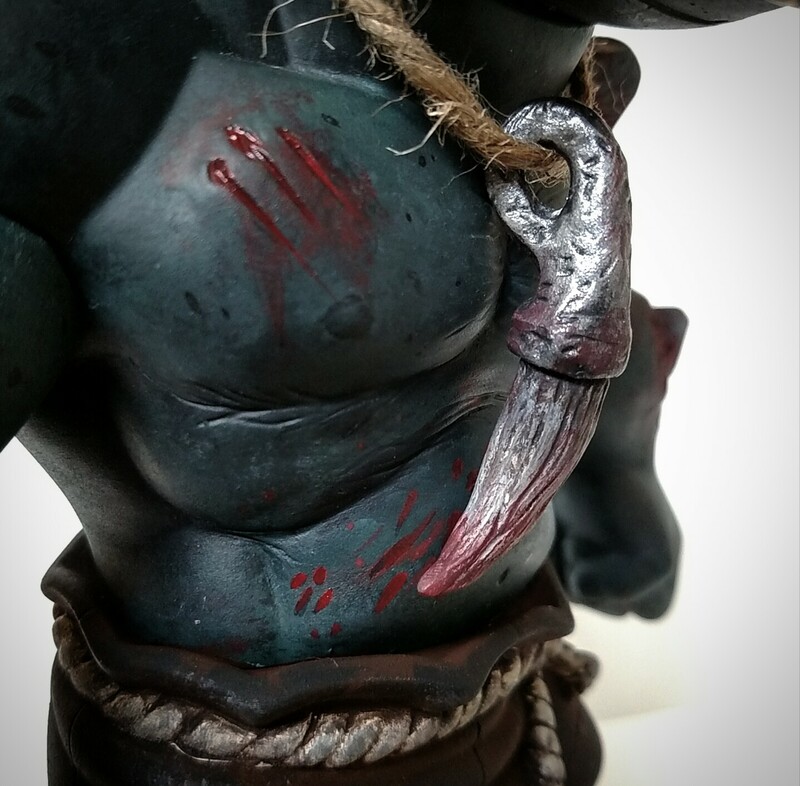 Each Satyr will be priced at $95 and is limited to just 30 handmade pieces. 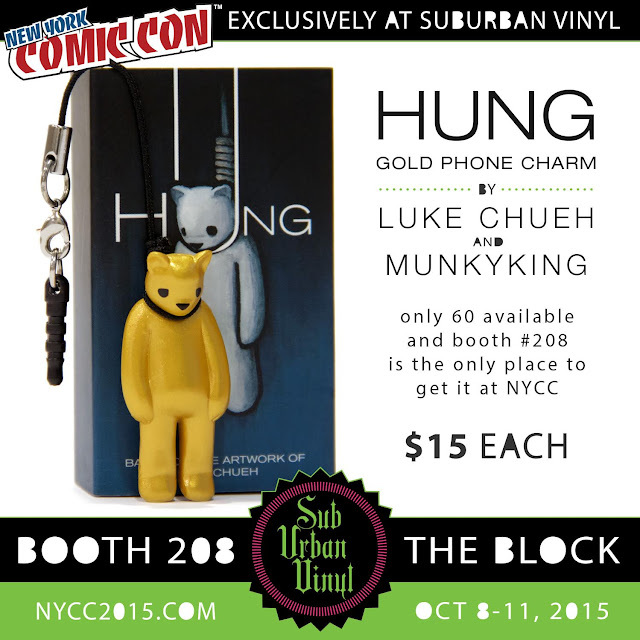 Pick one up at MPH at booth #113, during NYCC 2015. YOU ARE INVITED to join the Rollin Gobis Show!